This is the first post in my new series of cheap eats from your pantry. 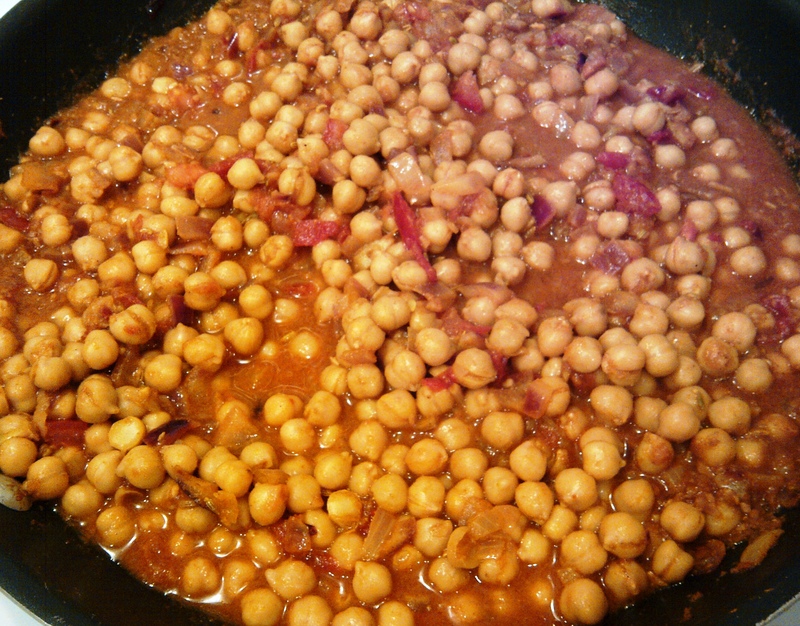 Last night I made Channa Masala for dinner. Channa Masala is a dish made primarily of chickpeas, with origins in South Asia (mainly Pakistan and in Northern India). Although it is usually served mostly dry, I prefer mine to be a little more saucy. My choice of dish also happened to coincide with Meatless Monday…which was surprisingly a big hit in my chicken/beef/lamb (meat-a-tarian) loving household. DH: This has no meat in it? Me: Nope. Just garbanzo beans…spices, tomatoes, onions and garlic. DH: This tastes pretty wicked. I think I like Meatless Monday. Me: (taking a bite) That’s so tasty! I like all the non-animal protein, and the flavour! DH: I’m full…but not in that crappy ‘I ate too much kind of way’. In a good way. And there you have it. Four thumbs waaaay up. I have a feeling that while Meatless Monday might not happen all the time, it will definitely happen more often. The cost of the entire dish (including rice) came to about $3.50 – or $0.88 per serving. It’s times like these that I’m so grateful for having a spice cabinet bursting at the seams. 1. Mix coriander, cumin, cayenne, turmeric, whole toasted cumin seeds, paprika and garam masala together in small bowl. 3. Add the onion, ginger, pepper flakes and garlic. Saute until starting to brown (this should take about 5 minutes). 4. Turn heat down to medium-low, then add spices from step 1. 5. Cook until fragrant, about two minutes. 6. Add chopped tomatoes with their juices. Scrape up any bits that may have stuck to the pan now. 7. Add water and chickpeas. 8. Simmer for 10 minutes until tomatoes start breaking down. 9. Stir in lemon juice and add salt to taste. 10. Serve on top of basmati rice…and with some naan along side (if you wish).